Tag Archive | "Latin food"
Ecuador food prices are low. 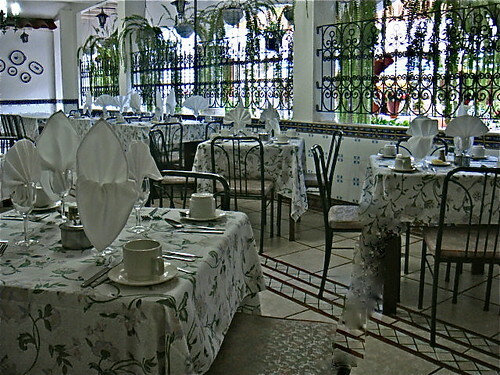 There is a lot more to Ecuador food than just the low price. Ecuador food is not anything like Northern Latin food. Beans & rice … tacos… tortillas… enchiladas… burritos etc. 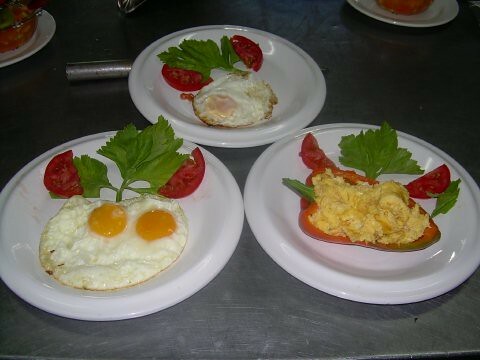 are NOT the typical food. 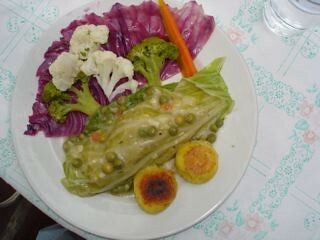 Here is a typical Al Muertzo (lunch of the day) at Meson de las Flores… beef stuffed cabbage… fresh vegetables and potato pancakes. 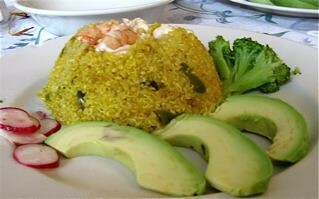 Here is another, steamed quinoa with avocado and shrimp. Availability is of good food is great! 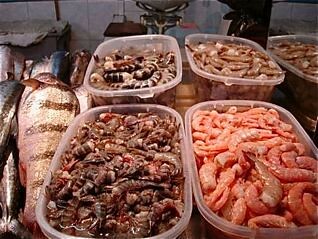 Here are some shots I took at the Ibarra seafood market. 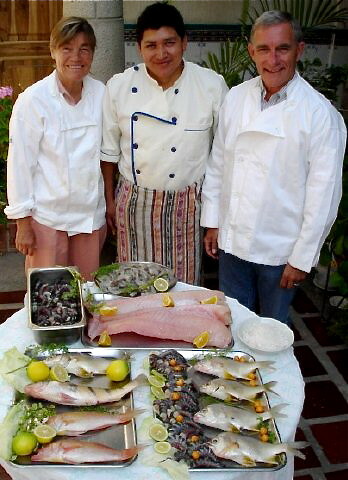 Even in the Andes, There is a huge selection of great Ecuadorian seafood. Plus the people put such great energy in the production… the growing… the selling at the market and the cooking. 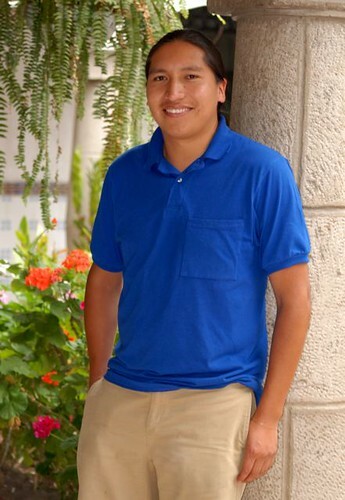 The Ecuadorian people are warm and friendly Every step in the process. Merri and I love to get in the kitchen with the staff and cook. Merri is a great cook and the staff are kind so they tolerate me! The process of preparing and cooking is fun and after the work, the staff all dine together… laughing, joking and giggling after a long day. Here they are eating in the kitchen. the juice. 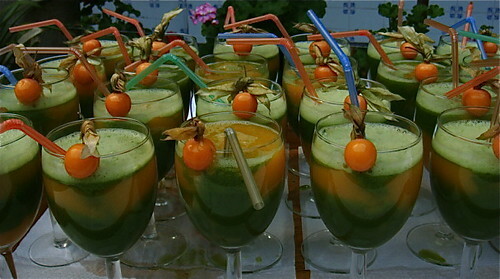 Here is the juice one morning, fresh squeezed alfalfa and mango juice. 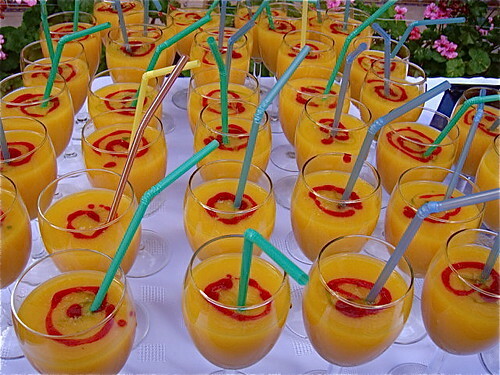 Another day it is mango juice with raspberry. The staff even put their enthusiasm into the linen! 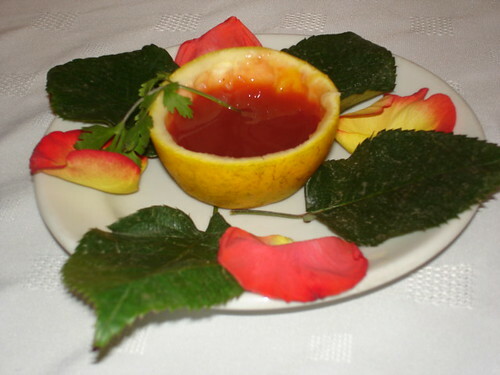 Even the catsup (I would rather not serve it at all, but some guests insist) gets special treatment… served in a carved out grapefruit. The chefs are serious about serving great food. 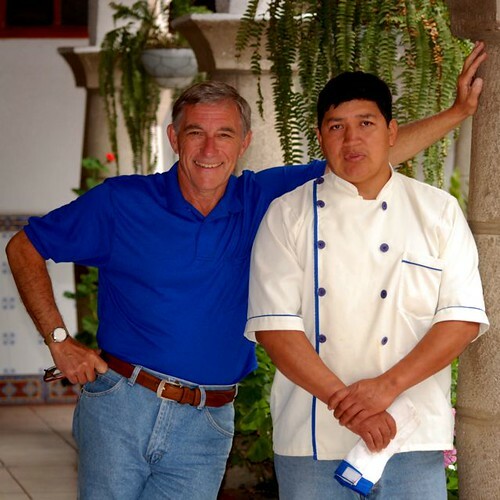 Here I am with our chef Santiago. 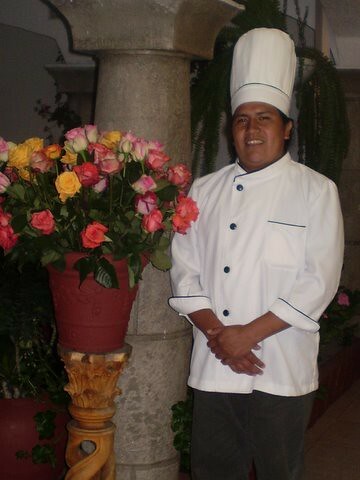 Alberto, our sous chef, is a maestro as well. 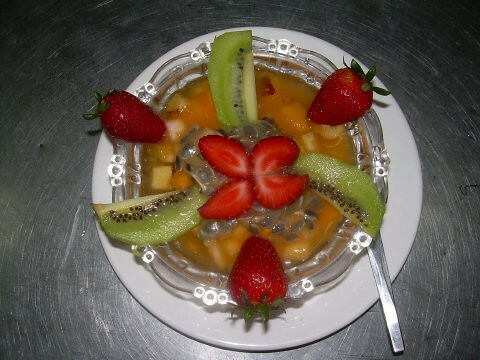 The staff are always looking for ways to make the food look better when they serve. 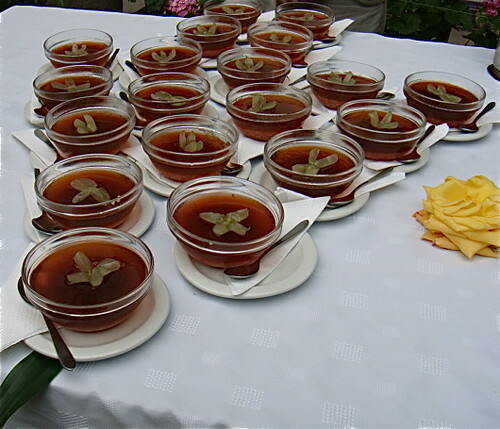 Here are some typical coffee break servings for our course delegates. 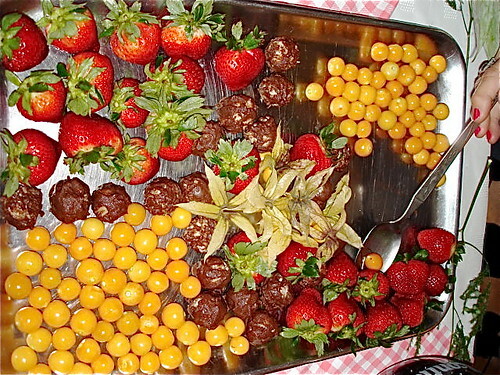 Fresh strawberries and gooseberries with shredded fresh coconut and dipped in Ecuador chocolate. Ecuador food and all this beauty is possible at really affordable prices because the base prices of Ecuador food is so low. I asked Mauritio, our night watchman and concierge to visit Cotacachi market and get some prices of Ecuador food. 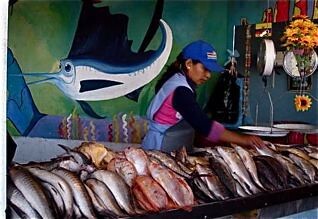 At the Cotacachi market a trout cost $1.66 but if you buy four or more then the prcie drops to $1.25. Lomo fino, the best beef for one kilo is $5.28 ($2.40 a pound). Chicken is $2.64 a kilo ($1.20 a pound). One kilo of apples is $1.25 (8 apples). This is 56 cents a pound. One kilo of pears is $1.25 (8 pears – 56 cents a pound). A liter of fresh milk (appx. quart) is 40 cents. A batch of 20 bananas is between 25 and 50 cents. Low price is not everything when it comes to food. Quality, freshness and ripeness…plus the way it is grown, prepared and served all count. in Ecuador you can get all the above at a price that is easy on the pocketbook. 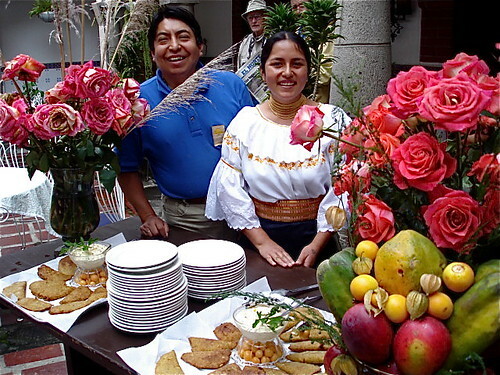 Enj0y Ecuador food on our upcoming Ecuador tours.